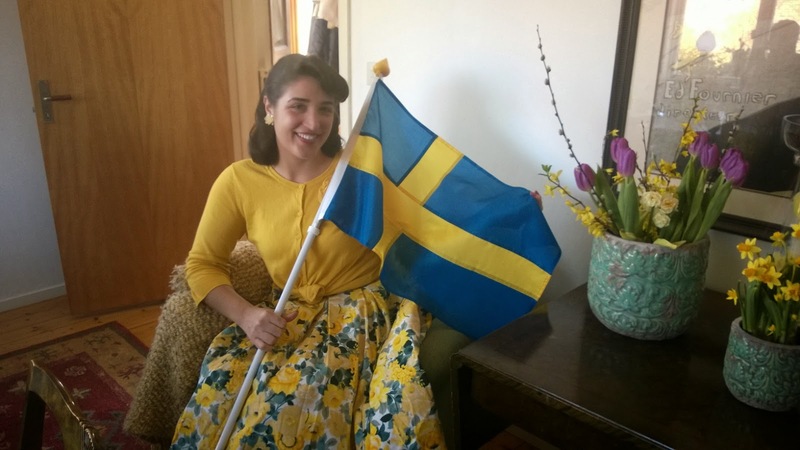 Milan of Hawaii: My first Easter as a Swede! I hope you all had a happy Easter and an enjoyable long weekend! 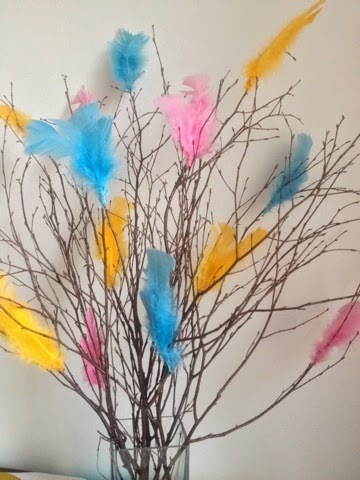 I did a little Easter decorating in the apartment in preparation for the weekend. I made påskris, which is a traditional Swedish decoration for Easter. 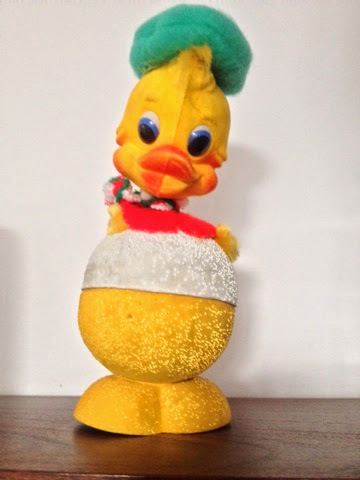 I took out my boyfriend’s 70’s Easter egg duck too. 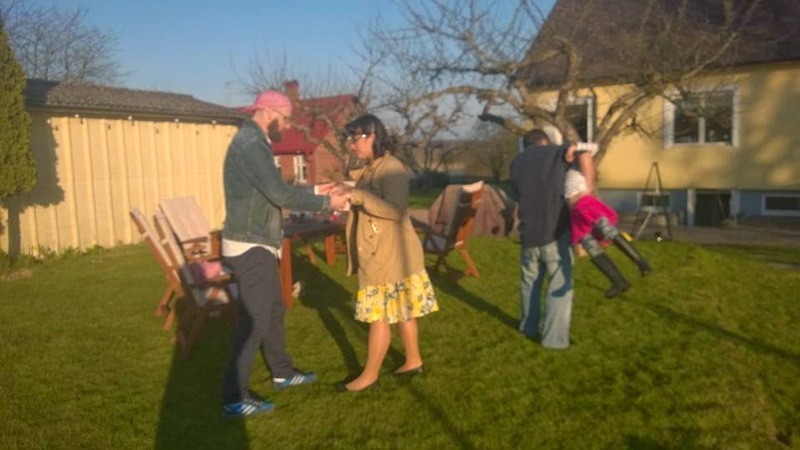 But on Saturday, or Easter eve, I got the chance to head out of the city and celebrate Easter out in the country with my boyfriend and his family who live in the middle of Skåne in Hallaröd and Höör. We stayed at his sister and brother-in-law’s place in Hallaröd. 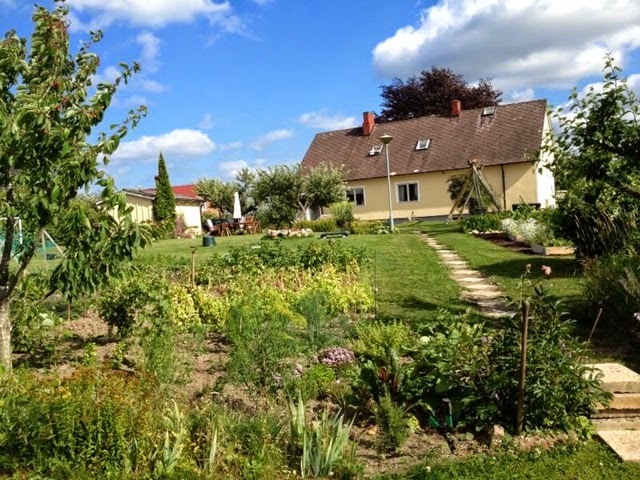 They have a big beautiful old farmhouse out in the countryside, complete with a garden in the backyard. Okay, I know what you're thinking. This is obviously not a springtime photo. Yes, this photo is from last summer. I forgot to take a photo while i was there this weekend and I just needed to show you how beautiful this place is. Feeling very eastery outside of their storage house in the backyard. 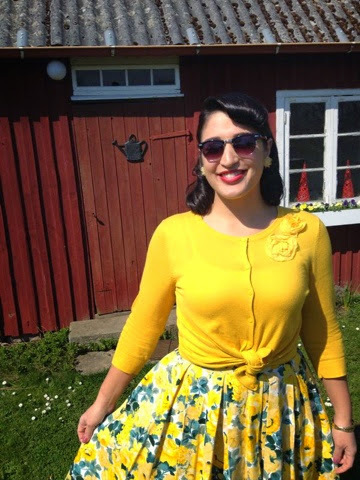 I’m wearing a skirt from a vintage inspired Swedish designer, Emmy. 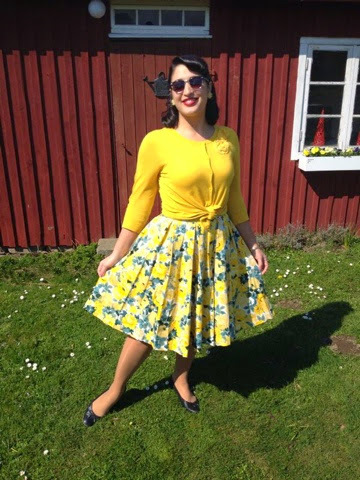 Yes, not actually vintage, but I find vintage reproduction skirts to be great sometimes, especially for bigger gals like me whose size can be harder to find. And this one is just such a vibrant yellow on a sturdy, textured fabric. The past few weeks have been so cold and windy, so we were especially lucky on Saturday and Sunday. It was warm, sunny and calm. Just perfect for a nap in the sun after a traditional Swedish holiday meal of pickled herring and potatoes washed down with shots of snaps and beer. Yep, a nap in the sun after all that is just the ticket! After the nap, we spent the rest of the day outside having coffee and dessert, some glasses of wine, listening to music and just enjoying the sunshine. We even had a dance party. Here we are rocking out to Louis Prima! After a grilled dinner and some good conversation, the dance party continued late into the night. On Easter Sunday, we went to my boyfriend’s parents’ home in Höör to celebrate not only Easter but also his mother’s birthday. 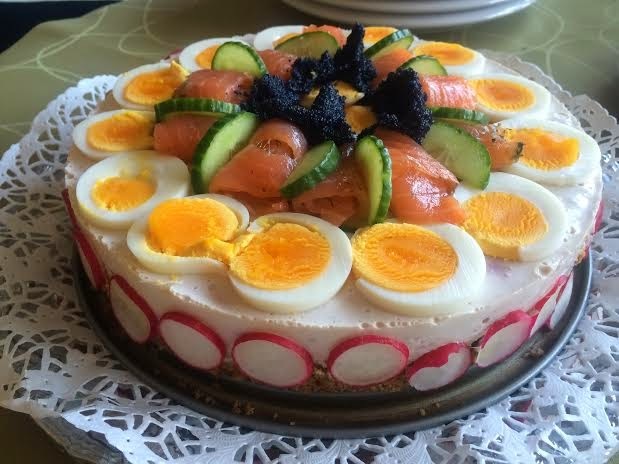 We celebrated with this very beautiful silltårta (herring cake) decorated with smoked salmon, eggs, caviar, and vegetables, along with all of the traditional Swedish Easter foods. The weather was beautiful and warm once again and we got to eat our strawberry cake out in the sun. Later, back in Hallaröd, we ended the day with a short hike through the countryside and forest. Monday was a day of relaxing. Even in the few days we were there you could really see how quickly the plants were sprouting and trees beginning to bloom. We took a short walk out to the lake before heading back to Malmö. I can’t wait to see it in the summer and go fishing in the lake! Once back in Malmö, my boyfriend and I saw Nattvak, a play at Teaterrepubliken. My guy’s big brother did the music for the play, so we really wanted to check it out. It was the first Swedish language play I’ve ever attended. Everything was really well done and I was glad to have the chance to see it. I decided to wear my new (to me!) 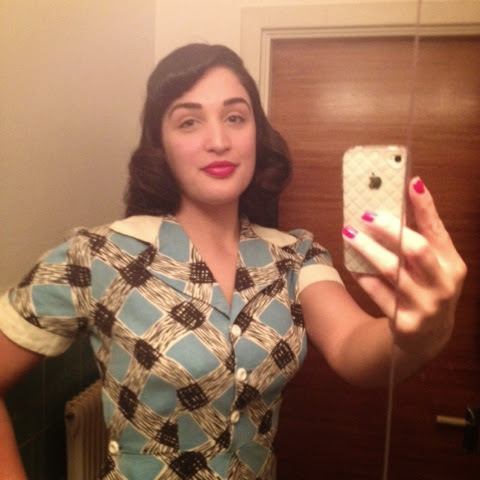 1950’s dress that I got this past week to the play. Hi Milan! I am loving your blog. So glad you're writing! 1. Your makeup. You always look gorgeous. 2. The process of getting Swedish citizenship. how? how long? Curious to hear about it!